"Akh! S neba vysoty blesnuv"
"Vot i dostigli my opushki lesa"
"Akh! Pen'yu solov'ya vsego priyatneye vnimat'"
Entr'acte (Courants d'air) - "Ognya, ognya"
Marche chinoise - "Velikiy imperator"
Chant du rossignol - "Akh! Serdtse dobroye"
Jeu du rossignol mécanique - "Tsk, tsk, tsk, tsk "
Introduction - "My vse pred toboy"
2. Narrator: "Phew, this isn't a bad sort of spot"
4. Narrator: "Enter the Devil"
6. Narrator: "Hurray, here we are! We're home at last"
8. Narrator: "The Devil was standing therre"
10. Narrator: "He took the book"
12. Narrator: "They have nothing - and yet they have it all"
15. Narrator: "Now he comes to another land"
26. Narrator: "I have everything, he thinks"
2. Serenata: Larghetto "Mentre l'erbetta pasce l'agnella"
Poco più vivo "Benedetto, maledetto"
6. Allegro "Gnora crediteme ch'accossi è"
7. Allegretto "Contento forse vivere"
9. Allegro (alla breve) "Con queste paroline"
17. Tempo di minuetto "Pupillette, fiammette d'amore"
"U pesen vsekh slova odni"
"Net, ne zabyt' vo veki mne pokoynitsu"
"Gde tak dolgo ty byla?" "Parasha!" / "Ya, Vasiliy milyy!" "Ya zhdu, ya zhdu pokorno"
Prologue: "Spectateurs, vous allez entendre"
"Edipe interroge la fontaine de vérité"
"Le témoin du meurtre sort de l'ombre"
"Divum Jocaste caput mortuum!" - "Sanguis ater rigabat"
"Divum Jocaste caput mortuum!" - "Ecce! Regem Oedipoda"
"Fair lady, gracious gentlemen" / "I wished but once"
"I'll call the coachman, sir"
"Dear father Trulove" / "Laughter and light"
"With air commanding and weapon handy"
"The sun is bright, the grass is green"
"Vary the song, O London, change!" "My love, am I to remain in here for ever?" "As I was saying" / "Come, sweet, come" / Scorned! Abused!" "My heart is cold, I cannot weep"
"Who hears me, knows me" / "Seven - eleven" / "Behold it, Roman, moral" / "Fifteen - and a half" / "Wonderful" / "An unknown object draws us" / "Fifty - fifty-five"
"Sold! Annoyed!" / "Now what was that!" "You love him" / "If boys had wings"
"I go to him" / "Who cares a fig"
"How dark and dreadful is this place"
"Very well, then, my dear and good Tom"
"Well, then" - "My heart is wild with fear"
"I burn! I burn! I freeze!" "Prepare yourselves, heroic shades" / "Madmen's words are all untrue" / "Leave all love and hope behind"
"There he is. Have no fear"
"Good people, just a moment"
Melodrama: "In a worm's likeness will he wend"
The Catalogue of the Animals:"The Lord bade that I should bring"
The Comedy (Noah and his wife): "Wife, come in!" The Covenant of the Rainbow "A Covenant, Noah, with thee I make"
Three Little Songs "Recollections Of My Childhood"
Song of Parasha "Droog moi mily"
1. Marche du soldat - 2. Le soldat: "Voilà un joli en- droit"
3. Musique de la 1ère scène - 4. Le diable: donnez moi votre violon"
5. Marche du soldat - 6. Le soldat: "Bravo"
7. Musique de la 2ème scène - 8. Le soldat: Ah! Bri- gand! 9. Musique de la fin du 2ème scène - 10. Le lecteur: "il s'était mis"
11. Musique de la fin du 2ème scène - 12. Le diable: "Regarder, monsieur"
14. Marche du soldat - 15. Le lecteur: "Un autre pays"
. . . splendid performances of all he wrote occupying only 133 mm of shelf space.
. . . [there are countless gems scattered through the set and a huge range] of interpretations to choose from, and more rarities . . . listeners are bound to come across treasures they never knew about . . . the special pleasures include everything from the conductorless Orpheus Ensemble, Isabelle van Keulen and Olli Mustonen in the "Duo Concertant" . . . and the best of many representations of the "Fairy's Kiss" music . . . Rozhdestvensky's "Moscow Mavra" is an idiomatic treasure, while the vocal contributions are all classy, with a chance to remember three fine English tenors no longer with us -- Philip Langridge, Anthony Rolfe-Johnson and Robert Tear . . .
. . . die spröden Spätwerke in exzellenten Wiedergaben . . . der "Sacre" mit dem unerschrockenen Uraufführungs-Dirigenten Pierre Monteux, die zeigt, dass ein bedeutender Dirigent zur innigen Annäherung an eine solche Partitur nicht unbedingt Jahrzehnte des Abstands benötigt . . .
Luxueuse, incontournable et d'un repérage aisé . . . cette intégrale Stravinsky vise les sommets. Elle est l'aboutissement d'un projet de longue haleine de la part du prestigieux label allemand Deutsche Grammophon (DG) . . . Il faudrait encore citer bon nombre de chefs et de solistes prestigieux (Riccardo Chailly, Reinbert de Leeuw, Katia et Marielle Labèque, les frères Kontarsky, Maurizio Pollini . . .) contribuant à la hauteur de cette intégrale. En bonus, Martha Argerich . . . joue la version pour deux pianos du "Sacre du printemps" avec Daniel Barenboim: une expérience d'écoute unique assurément! . 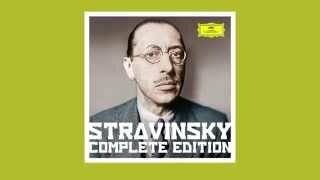 . . le coffret Stravinsky 2015 marquera son époque, consacrant la musique d'un des plus grands génies . . . The first edition of Stravinsky's Complete works ever. Performed by an array of great Stravinsky interpreters including Abbado, Ashkenazy, Bernstein, Bostridge, Boulez, Chailly and many more.